Asian cuisine is a tremendous source of Lenten dishes. There are many fish-based and vegetarian delights to choose from. These recipes often contain no dairy, or what there is can easily be replaced with olive or other oils. Best of all, this food is flavorful and exotic so you don’t feel like you’re denying yourself. In fact if you save these dishes especially for Lent, it can feel like a celebration. Lately I have been infatuated with Fuchsia Dunlop’s magnificent Chinese cookbooks. Today’s recipe is a savory, spicy (but not too hot) fish dish from Sichuan province. It does require some specialty ingredients, but if you live near a chinatown this can be easily accomplished. There are also good mail order sources for much of what is needed (see recipe below for details). Don’t be intimidated by the bright red oil that drenches the fish. It’s purpose is to stimulate your senses with it’s deep color and spicy, almost floral fragrance, you are not expected to eat it. Take the fish out of of the oil with your chopsticks, leaving most of it behind on the plate, along with the whole spices which have also already done their job. If you haven’t eaten Sichuan food before, know that while it is spicy, it is not as fire engine-hot as you might expect. One of the most important ingredients is Sichuan pepper which is not at all spicy, but instead causes a physical sensation of numbness and tingling in the mouth. It is very sensuous and pleasant, and really makes this cuisine special. If you live in New York City, see my previous article about shopping for sichuan ingredients in Chinatown. There are also photos there of whole facing-heaven chiles and Sichuan pepper so you’ll know what to look for. Unfortunately, I have not found a good mail order source for the facing-heaven chiles so if you don’t live near a chinatown you may need to substitute. I have read that pequin chiles can be used, but the flavor is not the same. Beware, if you use the long skinny Thai chiles (also called bird’s eye chiles), they are much hotter than Sichuanese chiles so you should use less. I can highly recommend the Sichuan pepper available via mail order from Adriana’s Caravan, it is very fresh and flavorful. They also carry the chili bean paste, which they call Chili Bean (Toban Djan) Sauce. When shopping for this item try to get a version made with fava or broad beans instead of soy beans. It is important to measure and chop all of your ingredients before beginning this dish. Once you start cooking it goes very quickly, so have everything prepped in small containers and ready to go. Marinate the fish: lay your fish fillet on a cutting board and cut it into ¼-½ inch thick slices by holding your knife almost parallel to the cutting board and making very shallow cuts. Put the slices in a small bowl and add the salt, wine or sherry, ginger, and scallion, and toss gently with your fingers. Let stand while preparing the rest of your ingredients. 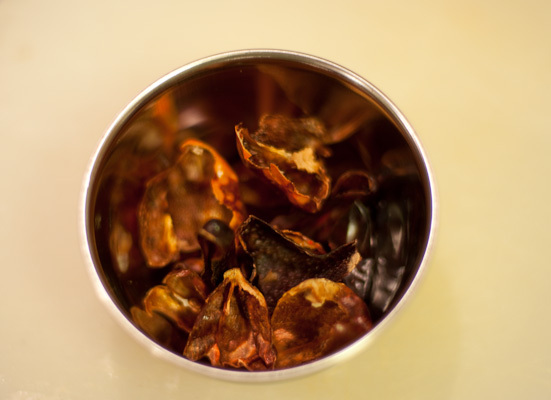 Snip all of your dried chiles in half with scissors and shake out as many seeds as possible. If you have sensitive skin you may want to wear gloves. In any case, wash your hands thoroughly with soap after handling the chiles and be careful about touching your eyes. Cook the base flavorings: heat 3 tablespoons of oil in a wok over a high flame. When it begins to smoke, turn the heat down and add the chile bean paste and stir-fry until the oil is red and fragrant. Add the ginger, garlic, scallions, dried chiles, and Sichuan pepper and continue to stir-fry until it is very fragrant and the scallions are tender. Keep an eye on the temperature, you want the oil sizzling but not so hot that it will burn the spices. Pour the contents of the wok into a deep serving bowl. Cook the fish: bring a medium saucepan full of water to a boil over high heat. Meanwhile, discard the ginger and scallion from the fish marinade. Mix the cornstarch and cold water to form a thin paste. pour the paste over the fish slices and toss gently with your fingers until all of the slices are well coated. When your water is boiling, drop all of your fish slices into the pot. DO NOT stir until the water has returned to a boil or the coating will come off. Allow the water to come back to a boil and cook the fish slices until they are just done and nicely flaky (about 5 minutes). Use a slotted spoon or skimmer to remove the fish slices from the pot and put them in the serving bowl on top of the base flavors. 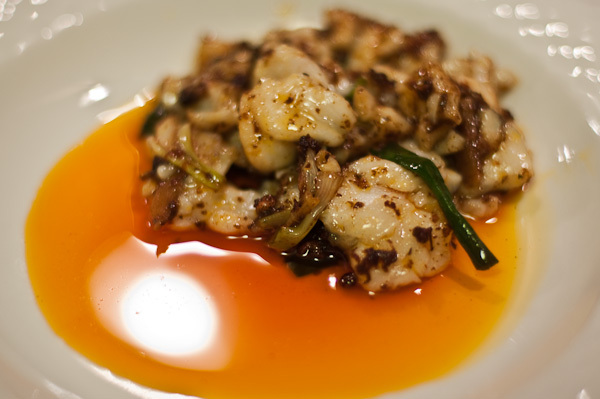 Make the spicy oil: Quickly heat ¾ cup of oil in the wok over a high flame until it begins to smoke. Turn down the heat a little and add the chili bean paste and stir-fry until the oil is red and fragrant. Add the remaining chiles and whole Sichuan pepper and stir-fry until they are crisp and fragrant, the longer you go, the spicier it gets. The oil should be sizzling but not so hot as to burn the spices. When it is ready, pour the hot oil and spices over the fish in the serving bowl and serve immediately while it is still bubbling. I’m in awe of you. What a delicious way to handle the restrictions of Lent. Thanks Tinky. It makes it more fun and less like self-denial. It’s also a great opportunity to plumb the depths of my extensive cookbook collection.